Typical applications include process control in the chemical and petrochemical industries and monitoring of influent and effluent in both industrial and municipal wastewater treatment plants. 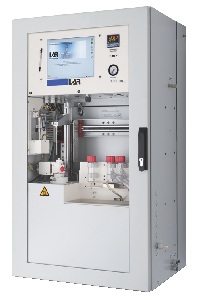 On-line analyzer for automatic, reagent-free measurement of the true total bonded nitrogen (TNb) according to DIN 38409 chapter 27, ISO TR11905-2 and ENV 12260, in solids-free wastewater or process water streams, standard version for one sampling point, optional two streams, continuous output of results for monitoring and controlling. Installation of an EC-cell or alternatively a chemiluminescence detector for the analysis of nitrogen oxide in the gas phase for on-line determination of the total nitrogen content according to ENV 12260, incl. piping. 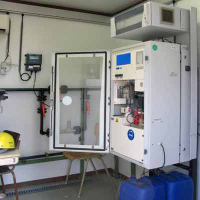 Analytical system consisting of high temperature oxidation furnace with a working temperature of more than 1,200 °C for determination of the total nitrogen content, continuously flow-through sample vessel with magnetic stirrer, vessel for calibration solution, sample transfer and injection module with septumless injection port, acid filter and carrier gas cooler. The possibility to combine the analyzer with the measuring of the chemical oxygen demand (COD) or the total organic carbon (TOC) is given. Control / evaluation level with industrial CPU, menu-driven, self-explanatory software with integrated help files, splash-water-protected keypad, 10'4 '' Graphic-LCD-screen, presentation of the measured values in graphical or in table form, display of calibration values, daily protocol or 24-hours graph, data storage for one year. Memory card storing the operational software for automatic startup in the event of power loss or interruption, automatic calibration procedure. Homogenizer for continuosly homogenisation of the sample depending on the measurement cycle of the QuickTONb. Installation of an additional gas purifying and further hardware changes, e.g. control of the system pressure for total salt concentration > 1% (equates to 10 g/l). With the high temperature of 1.200 °C the salt will be completely melted and blockages will be avoided. Salts have no bearing on the measurement. Software extension, installation of an additional pump and piping for the additional measuring channel. Additional installation of another measuring stream for TOC direct method. Additional infrared detector for the second sample channel, measuring range from 100 - 50.000 mg/l C, ready for operation. Additional infrared detector for the second sample channel, measuring range from 5 - 4.000 mg/l C, ready for operation.